The Trump administration is crafting a $12 billion emergency aid package to help farmers affected by tariffs on their crops, the U.S. Department of Agriculture said Tuesday. Aid will come in three ways: Direct payments to farmers who have been hurt by escalating trade tensions. A food purchase program, in which the government will buy unsold food and distribute it to food banks. And a program in partnership with the private sector to create new export markets for American farmers. On a call explaining the assistance, the administration said the $12 billion value of the package was in line with the estimated $11 billion hit to farmers from recent trade tensions. Officials said Congressional approval is not required -- only Congressional notification. As for how farmers can apply for assistance, those details are still being worked out. Sen. Ben Sasse, a Republican from Nebraska, was highly critical of the plan in an interview with CBS News. "At no point have I heard a farmer or rancher say we want more bailouts. We want more welfare," said Sasse. "What they want is less trade war. There's no ambiguity about this from the producers in my state." American farmers depend on being able to sell overseas, and tariffs make what they produce more expensive. That hits demand and brings down prices, cutting into farmers' business. President Trump's tariff threats against China, Canada, Mexico and the European Union prompted immediate threats of retaliation. After $34 billion in tariffs against China went into effect earlier this month, China responded with its own equivalent tariffs soon after, targeting U.S. agricultural products including soy, corn, wheat, pork, poultry and more. The agriculture sector was already suffering before the president's tariffs. Soybean prices were already falling, dropping 19 percent since early May to a 10-year low and corn is down more than 15 percent. At current prices, most farmers lose money on corn, dairy, soybeans and pigs. This turmoil over tariffs is just the latest to hit struggling American farmers. Since 2013, overall annual net farm income has decreased by 50 percent, and the USDA predicts it will drop to negative $1,300 this year. Debt-to-income ratios for farmers are at a 34-year high. About one out of every three rows of U.S. soybeans is shipped to China, according to estimates. 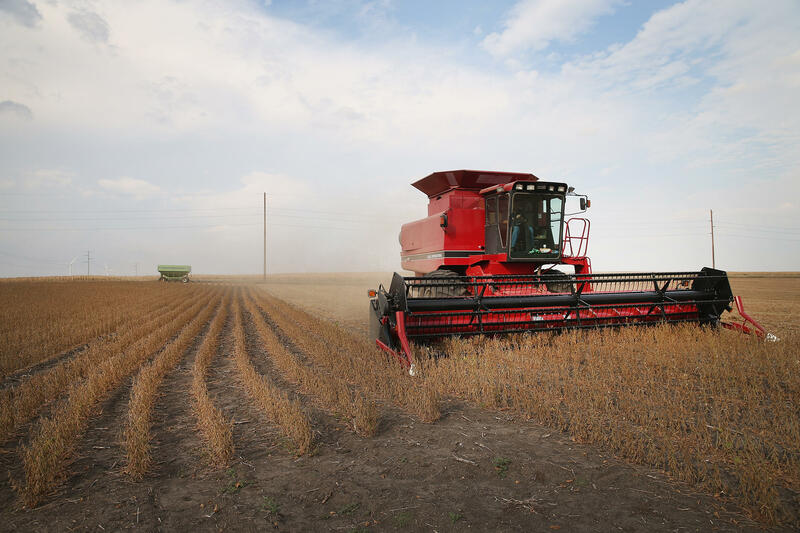 Farmers in Iowa alone could lose as much as $624 million on soybean shipments to China, Donnelle Eller, an agriculture reporter with the Des Moines Register, told CBSN last month. There's no sign of a quick resolution to the trade dispute. The U.S. and China have threatened to impose 25 percent tariffs next week on $16 billion of each other's goods. And on Tuesday, Mr. Trump announced plans to impose 10 percent tariffs on an additional $200 billion in Chinese imports by the end of August. China said it would retaliate, leaving even more U.S. farm products at risk. "This is a short-term solution to allow President Trump time to work on long-term trade deals to benefit agriculture and the entire U.S. economy," said Sonny Perdue, the secretary of agriculture, in a statement. "America's hard-working agricultural producers have been treated unfairly by China's illegal trading practices and have taken a disproportionate hit when it comes illegal retaliatory tariffs. USDA will not stand by while our hard-working agricultural producers bear the brunt of unfriendly tariffs enacted by foreign nations." Earlier Tuesday, the president praised tariffs in a tweet. "Tariffs are the greatest! Either a country which has treated the United States unfairly on Trade negotiates a fair deal, or it gets hit with Tariffs," Mr. Trump wrote. "It's as simple as that - and everybody's talking! Remember, we are the 'piggy bank' that's being robbed. All will be Great!" Sasse called trade wars "stupid," and said the president misunderstands the economic forces at play. "The president often talks as if governments are at the center of this transaction. They aren't. And American families and American producers would like governments to get out of the way so they can buy and sell the stuff they want and so that our farmers and ranchers can feed the world," he said. "The president's tone regularly suggests somehow that the government has created this bounty. It's not true. Workers have created this bounty and governments are the ones messing it up." Reporting by Jacqueline Alemany, Jennifer Janisch and Katiana Krawchenko.